The Rheem Performance Line. Exclusive to the Home Depot! A 50 gallon power direct vent gas water heater, providing an ample supply of water to households with 3-5 people. This model has a 6 year limited tank and parts warranty plus a 1 year in home labour warranty. Featuring a Honeywell electronic ignition (no pilot light) gas valve with self diagnostic capabilities that alerts the user to the operating status of the unit. 40 000 BTU input for greater hot water delivery. Want better efficiency, limitless hot water, and space savings? Consider Rheem condensing tankless (SKU # 1000730128). Power direct vent 50 gal. tank provides ample hot water for households with 3-5 people. Honeywell electronic ignition (no pilot light), self diagnostic gas valve. Alerts the user to the operating status of the heater. 6 year tank and parts, 1 year labour limited warranty. 40 000 BTU input for fast water temperature recovery. Maintenance Free Burner System, offering maximum protection against flammable vapors. 6 Year Limited Tank and Parts. Rheem Exclusive First Year In Home Warranty. GE 40 Gallon Natural Gas Water Heater. 12 Year tank & parts limited warranty. Self cleaning. 1 Year full in-home service warranty. 40,000 BTU input. Piezo ignition system for "no match" lighting. High Altitude compliant. Factory installed T & P relief valve. SmartShield Sensor System with exclusive air/fuel shut-off device gives double protection from igniting flammable vapors outside the water heater. Maintenance free combustion air intake, no filters to clean/replace. This model does not comply with the new B.C. energy codes. 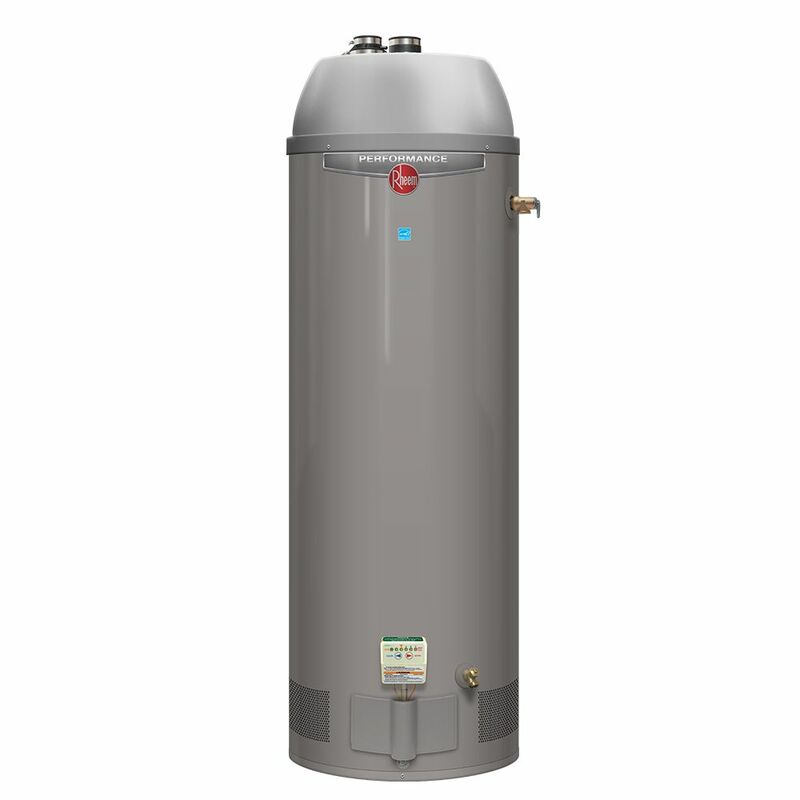 Rheem electric 39 gallon water heater. Exclusive Home Depot model. Offering exceptional value. Providing an ample supply of water to households with 2-4 people. This model has a 6 year limited tank and 1 year parts warranty. A patented magnesium anode rod design incorporates a special resistor that protects the tanks from corrosion, providing longer tank life. This unit comes with two 3000 watt elements and an automatic thermostat which keeps the water at the desired temperature, providing fast hot water delivery. Requires 240 volt electricity (a 20 amp breaker, with 12 gauge wire from the panel). Want a better warranty and piece of mind? Trade up to Rheem Performance (SKU # 1000792906). Rheem electric 40 gallon water heater. Exclusive Home Depot model. Offering exceptional value. Providing an ample supply of water to households with 2-4 people. This model has a 6 year limited tank and 1 year parts warranty. A patented magnesium anode rod design incorporates a special resistor that protects the tanks from sediment, providing longer tank life. This unit comes with two 3000 watt elements and an automatic thermostat which keeps the water at the desired temperature, providing fast hot water delivery. Requires 240 volt electricity (a 20 amp breaker, with 12 gauge wire from the panel). Also available in a BC compliant model. The smartest, quietest and most efficient hybrid water heater on earth features a heat pump design making it 4x more efficient than standard electric water heaters. Smart Rheem 50 Gallon Hybrid Electric Water Heaters feature integrated Wi-Fi connectivity for important mobile alerts, like Water Leak Detection for potential added savings. Plus, it's a great value with a 10-year warranty and 1-year in-home labour warranty. Rheem Performance Power Direct Vent 50 Gal Gas Water Heater with 6 Year Warranty The Rheem Performance Line. Exclusive to the Home Depot! A 50 gallon power direct vent gas water heater, providing an ample supply of water to households with 3-5 people. This model has a 6 year limited tank and parts warranty plus a 1 year in home labour warranty. Featuring a Honeywell electronic ignition (no pilot light) gas valve with self diagnostic capabilities that alerts the user to the operating status of the unit. 40 000 BTU input for greater hot water delivery. Want better efficiency, limitless hot water, and space savings? Consider Rheem condensing tankless (SKU # 1000730128).